I’m currently an IT systems engineer (official title “Systems Design Specialist”) working for The Pennsylvania State University, main campus. I’ve been doing IT since 2004. I started a B.S. degree in Electrical Engineering in Fall 2003, but never finished. My professional interests are around distributed systems, configuration management, automation, monitoring, metrics, distributed filesystems, cloud computing, immutable infrastructure, infrastructure as code, Kerberos, LDAP, and IPv6 evangelism. Currently I’m doing R&D around Amazon AWS, Microsoft AzureStack, Joyent Triton, FreeBSD, Terraform, Packer, Docker, and Kubernetes. I also have lingering operational responsibilities around the University’s central Kerberos realms, CFEngine for managing our on-prem Linux systems, logging (ELK, Splunk, traditional syslog), metrics (InfluxDB+Grafana), monitoring (Nagios), and the University’s central filesystem (IBM GPFS + Samba + NFS). 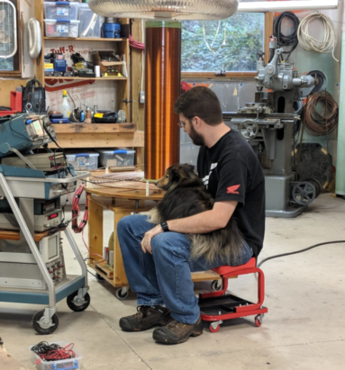 For fun, I enjoy welding, fabrication, machining, machine restoration (lathes, milling machines, tractors, motorcycles, etc), firearms, playing with high voltage, and riding and working on motorcycles (Honda inline 4s, specifically). I’m also a volunteer for the local historical railroad where I maintain our website, as well as help with maintenance of way activities, rolling stock maintenance, ticket sales, and excursion operations. I hope to become certified as a locomotive engineer in 2018 with the return of our Budd Rail Diesel Car, which is currently undergoing restoration. I hold an amateur radio license, callsign KB3EWY. I’m not active much, but in the past I’ve operated primarily on 2M FM, 10M SSB, and 2M APRS. © 2017-2019. Design derived from: Dimension. Powered by Hugo.